Another week, another chance to witness some a cappella-goodness. And once again, we're featuring another international group for our next installment of "Aca Live." Hailing from Queen's University located in the contemporary arts hub that is Kingston, Ontario, the Caledonias are of a different breed of performers, and it all stems from their "unique girl power" that oozes through their veins. Having been a staple on-campus for nearly 15 years, the personalities of each member of the all-female ensemble are as big as their moments onstage. And it's evident as soon as the first note is sung. Get the exclusive on what they're all about in our interview with the group below. After you've spent some time getting to know them on a personal level, be sure to see them perform live tomorrow night, October 25th at 10 PM/EST, right on our Facebook Page. The Caledonias was formed in 2002 by Karen Ng and Penny Miller in their first year at Queen’s. We were the first a cappella group on campus, and continue to be the only all-female a cappella group. Our style has changed over the years depending on the members of the group, with our current repertoire leaning towards pop contemporary and primarily consisting of pieces by strong female artists. 2. What makes The Caledonias so special? What makes members join your group versus looking into other student organizations? As the only all-female a cappella choir, our group shares a close bond and sisterhood, as well as a unique girl power in comparison to co-ed groups. Our members have joined for this specific reason (#GRLPWR) in addition to being attracted to our music style and wanting the “Pitch Perfect” experience that comes with being in a strong all-female group. 3. What are some of you all's favorite performances/moments from the past year or few years? Our favorite performance so far this year was when we sang at a wedding in September! The bride arranged for us to come surprise her fiancée at the reception since she was from a musical family. Being a part of their special day and seeing the genuine reactions from the bride and the crowd was amazing! 4. Currently, what are the top 3 shows that the group is currently streaming/watching? 5. What are some things that you all enjoy doing outside of music as a group? Just like the shows we watch, everyone has such a wide variety of interests! Some are involved in other areas of the arts like theatre or Bollywood dancing. A few members are peer learning assistants or TAs. Some are involved in yoga or weightlifting. We even have members in Queen’s Model Parliament and the Queen’s Female Leadership in Politics Conference. Then of course we enjoy de-stressing activities like cooking, baking, Netflix, and (most importantly) petting dogs. 6. Are there any big plans for the future (upcoming trips, albums, performances, collaborations, etc.)? Our biggest upcoming event is definitely the Queen’s Intercollegiate A Cappella Competition at the start of March. This term, our biggest upcoming event would have to be our winter concert in December that we do with our brother choir All the Queen’s Men. 7. Is there a funny memory or awkward moment from a past trip or performance that stands out in your mind? Last year at our winter concert we had just started using a pitch pipe for our starting notes (instead of a piano app), and we were trying to only do one note per song. We hadn’t practiced as much as we thought we did because when we started The Caledonia Song (our theme song for crying out loud!) we were extremely off pitch, but just kept going and no one was able to recover until half way through. It was the “cringiest” few minutes I think we’ve ever been on stage. 8. Back in March, you all competed in the 4th Annual Queen's A Cappella Competition, delivering one of the best Bishop Briggs' covers we've ever heard. What does it mean to the group to take part in a singing contest such as this, as well as compete in general? Would you say that competition is an integral part of The Caledonias' identity? Thank you! We’re so glad people have been so receptive to our cover! Since the founding of the competition (by us in collaboration with ATQM and Trillers) it’s become more of an integral part of our identity each year. We feel very fortunate that this event has become so well-received by the Queen’s and Kingston community and has grown to allow guest groups to come perform. Seeing talent from other schools inspires us to up our game, and pushes us to do better each year. Even though we didn’t place last year, we grew tremendously as a group and we got a lot of traction from our performance that made it all worth it. 9. If I was coming into town for a Caledonias' performance a) what's on my to-do list before the show? b) what local spot are we dining at after the show? Depending on the weather I’d definitely suggest going for a walk by the waterfront, checking out the farmer’s market at market square, then heading up to Martello Alley to see the local artwork. If it’s the winter, still head to the market square but this time for skating at the rink, then grab some dessert and a hot beverage at Sipp’s. I’d also recommend taking a walk down Princess to see the shops, and exploring the Queen’s campus to see all the beautiful architecture (we’re not called the limestone city for nothing)! Some good local food spots are Woodenheads, Megalos, Tommy’s, Score Pizza, Harper’s, and Kingston Brewing Co.
10. What’s the aca-scene like not only on the campus of Queen's University, but in Canada as well? How would you describe the culture? Are groups open to working together, is it super competitive, etc.? Have you noticed any differences from the American scene? At Queen’s the a cappella culture has drastically shifted just in the past five years. Each group used to operate fairly independently, with the only real collaboration happening between us and All the Queen’s Men at our year end concerts (for reference, ATQM is the all-male group, and Trillers and Momentum are the two co-ed groups). However, with the forming of the competition the groups have begun to mingle more and begin to create a community. There’s a fun rivalry between everyone when it comes to the competition, but it’s all in good spirit. At Queen’s, our focus is very much on our home competition versus American choirs that aim for the ICCAs. 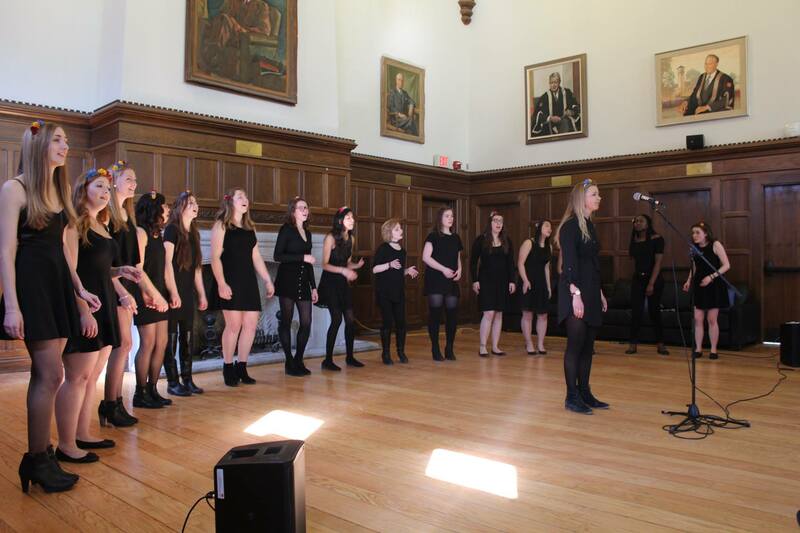 In general, a cappella culture in Canada is much more laid-back compared to the US, especially at Queen’s since students are involved in so many things. 11. What has been the most rewarding part about being in a college a cappella group? Likewise, what has been the most challenging aspect? The most challenging part about being in a college a cappella group is definitely scheduling. We range from 14-17 people, so getting everyone together for weekly rehearsals and gigs can sometimes be a challenge (requiring very late rehearsals after evening classes). We have students from all disciplines in our choir so there’s a lot to juggle. At the end of the day though it’s worth it to be part of the a cappella community at Queen’s. The most rewarding part is knowing you have a group of women constantly supporting you, and that you’ll be part of a lifelong sisterhood. 12. Anything else you'd like for our audience to know about the group? We really appreciate all the support we’ve been given from the a cappella community as both an all-female and a Canadian group. Thank you to College A Cappella for highlighting us last year and continuing to give us a platform to connect to the aca-community on a more global scale! 13. Lastly, could you give us some background on the below photo from your Instagram? What was the event and what was memorable about it? That’s a photo from ReUnion Street Fest this year! Our school holds an annual Homecoming weekend each October for alumni and current students alike, and one of the events is ReUnion Street Fest on Union Street. They have a headliner each year (this year it was Serena Ryder) and a few student groups are invited to perform as opening acts! It was a phenomenal experience to perform for the crowd, and we feel very fortunate to have had the opportunity! For more information on The Caledonias, connect with them on Facebook, Twitter, YouTube and Instagram.